Break up the grays by layering a variety of shades. The walls here are painted in Sherwin Williams – 7072, a nice midtone gray. 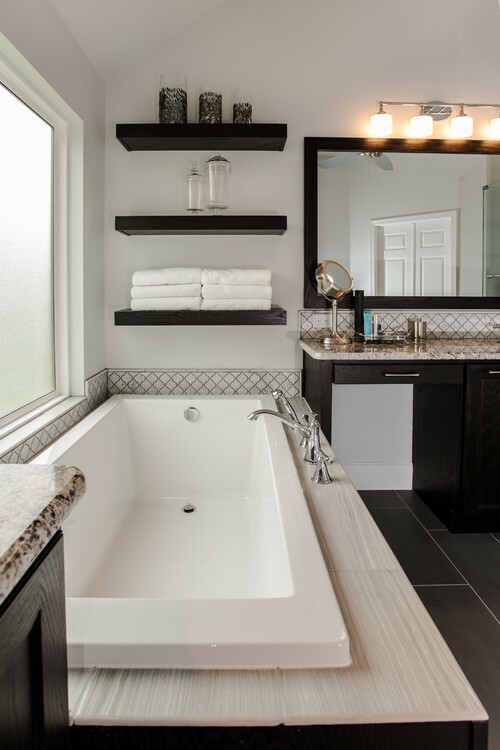 The gray tile around the tub really stands out against the lighter colors. The floor also has a few shades of gray in it, tying everything together. The gray hues differ from one another just enough to avoid a monotone look. Tiling an entire wall or walls can make a bathroom appear more luxurious and expansive. But depending on the tile used, it can also appear too busy. For this reason it’s a good idea to go for tiles in a muted or neutral hue, as shown in the image below. 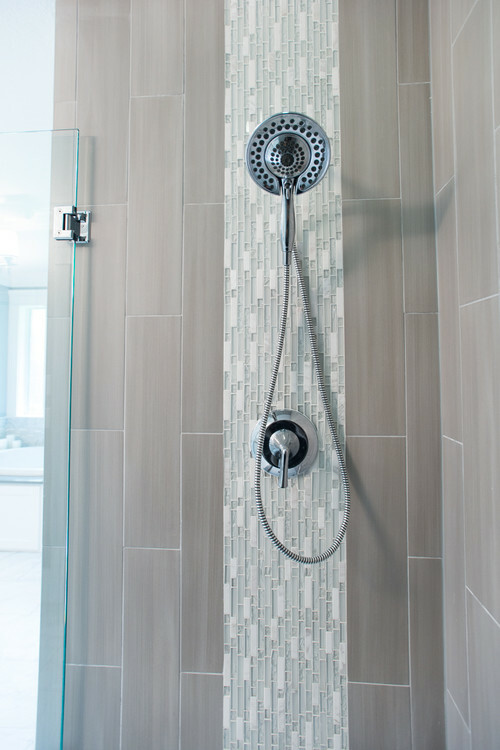 The soft wood (with a hint of gray) compliments the bolder, more assertive shower tile band. 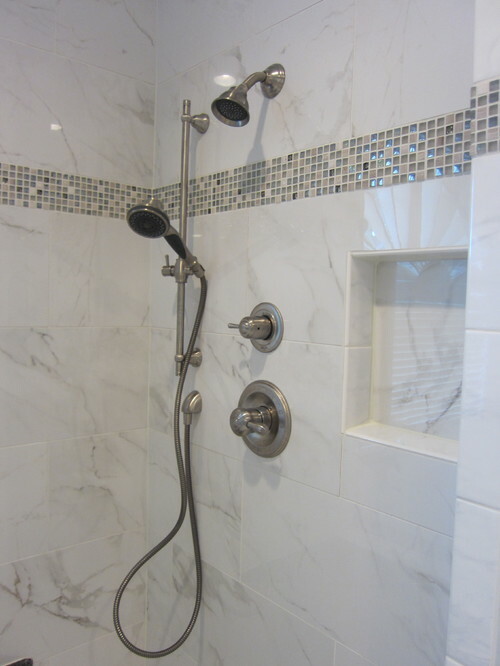 There’s no rule stating that bathroom plumbing fixtures such as showers and sinks need to be shiny and white. 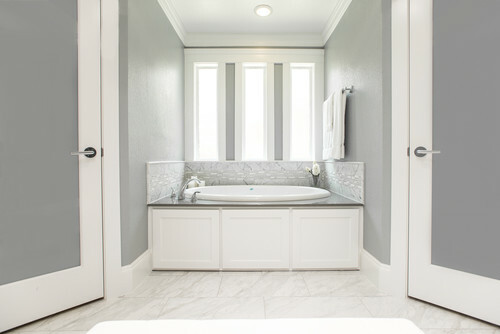 The soft gray fixtures in the bathroom shown here have a sculptural quality that brings uniqueness while staying true to the gray color scheme. The right touch of gray color can add instant elegance. If you go with dark stained cabinets, make sure the bathroom gets an abundance of natural light to break up and serve as a contrast. Using plenty of white materials and finishes will also help lighten and brighten up the space, and they partner well with a dash of gray. LoneStar Property Solutions creates your dream project while eliminating all of the guesswork, uncertainty, and sense of overwhelm that comes with remodeling. They do so through coordinated design, product selection, scope development, building services and an open line of communication with clients. From the first meeting to the final walkthrough their main concern is that you’re positively thrilled with the end results. LoneStar is a member of the National Association of Remodeling Industry (NARI), the Better Business Bureau with an A+ rating, and The Good Contractor’s List. Their designs and commitment to customer satisfaction have garnered the attention of industry associations and go-to home improvement sites.